Usually these stories are about postcards from the early 1900s. But this one is different – the view of Rock Island’s Third Avenue, looking east from 17th Street is only about fifty years old, new enough so that the scene is familiar to many of our readers. And to many, the most immediately recognizable features of this streetscape aren’t even buildings, but rather the television tower and the Dutch Inn neon sign. The sign is now gone, and that’s not all that’s missing. Today there are many gaps in what are called walls of the street where open spaces — parking lots — have replaced buildings. Just as a room is enclosed by walls, the buildings lining a street give the pedestrian a sense of that enclosure and comfort. And there has been more than demolition. Many of the remaining buildings have been changed, usually not for the better. Let’s imagine walking down these two blocks in 1952 just to see what’s there, while also knowing what the 2002 future holds. The first building in the shadows on the far left is the Richardson Hotel, which abandoned its earlier name of Sherman Hotel soon after Connor Looney was shot there. What looks like a slightly taller building behind it is part of the hotel. The storefronts hold D & H Credit Clothing and Dr. Harold Neilsen’s optometry office. The tall building next door with the deeply extending cornice is McCabe’s department store. Its unrecognized in 2002 because of its blindingly gold aluminum disguise. Even its cornice has been removed. Walking next door, we pass the Rock Island Bank and Trust building. It looks nearly the same in 2002, with only modest changes over the years (see Postcards from Home, June 9, 2002). As we cross 18th Street, there’s still a drugstore in the old Rock Island Savings Bank building, but WHBF has already built its new TV tower in the back. The magnificent old temple to money hasn’t been hidden under a modern exterior yet (Postcards, June 3, 2001). On our 1952 stroll, we walk past the antenna, and do some window-shopping in the one-story buildings – Ruth Purcell Clothing, Kent Shoes and the Athletic Shop. On the corner is Swan and Bahnsen’s drugstore, with its lunch counter and soda fountain. Across 19th Street is Spencer Square; we see its trees on the postcard. Diagonally across from Swan & Bahnsen’s is the Fort Armstrong Hotel (Postcards, August 12, 2001), visible near the center of the picture. We retrace our path but on the other side of the street. Because they are hidden behind taller buildings, the postcard doesn’t show all the places that we pass. Among them are the Fort Theatre (Postcards, Dec. 23, 2001), Manhard Realty, A&R Clothing, Duncan Wine & Liquors, Rock Island Laundry, Faigen’s Electrical Appliances, Orwitz Deli, and Greeve and Zeitler Paint. 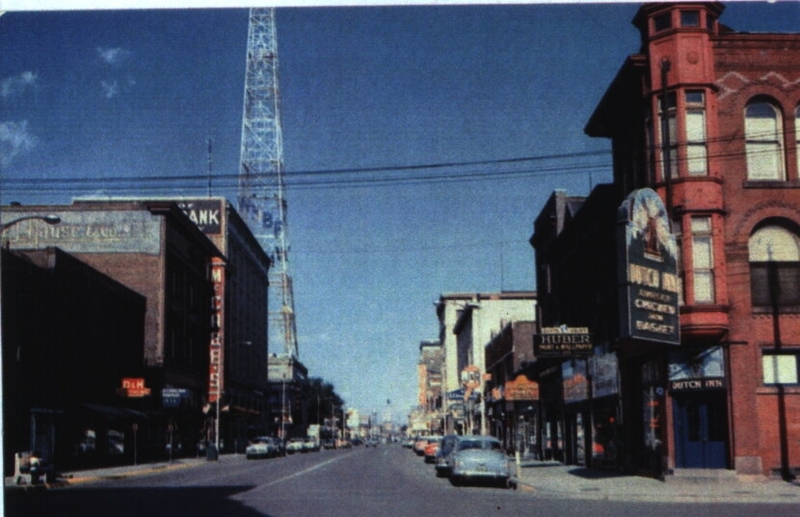 The tall buff brick corner building, very visible on our card, is the Safety Building (Postcards, July 22, 2001), which also is the home of McPike Drug Store. Once more crossing 18th Street, we pass the Como Hotel, a large, square, stuccoed four-story building that held various retail stores on its first floor. It lasted almost exactly fifty years before being demolished for a bank parking lot. We’ll write more about the Como at another time. The storefront level on this block houses a variety of businesses that add business vigor to our street wall — B. F. Goodrich, Hutch’s TV Service, Superior Business Machines, Spiegel Auto Supply, the Arrow Club tavern, Gillow Bakery. Many remember that the bakery store became Van Goor’s record shop a few years later. The three-story building is Robinson & Miller Hardware store, already in business for over 25 years. Even in 1952, peeking inside is a step back in time. Although the products may be new, their method of storage still relies on dozens of tiny drawers, open bins, and ceiling-high shelves reached by a rolling ladder. In 2002, the restored exterior looks the same, but the interior has been stripped. The two upper stories were known as the Savoy Hotel. Next door the Huber Paint and Wallpaper store has been in business nearly as long as the hardware store. In 1952, its original brick front looked much as it did earlier in the century. Sharing the building with Hubers is a children’s clothing store, Kiddyland, later followed by Gersich’s Junior Boot Shop. We end our stroll at the corner Dutch Inn, which was built in 1894 for Henry Tremann’s meat market. It was converted to a restaurant in the 1930s, but even in 1952, Mr. Tremann would have recognized his building. By 2002, the deep top arches of the windows have been bricked in, the graceful elliptical front window has been changed and orange tile has been applied to the front. And there’s more than the neon sign missing now. The building’s focal point, the cantilevered, metal-clad corner tower, is nowhere in sight, replaced by a blank brick wall. As this postcard – and a quick walk – will show, our Third Avenue streetscape has changed drastically in only fifty years. It is heartening to note the restoration efforts by many property owners and managers, who have opted to restore their buildings’ exteriors, rather than cover or demolish them. Despite this our formerly large downtown continues to shrink as buildings with strong historic connections are demolished. This article by Diane Oestreich, slightly modified, originally appeared in the Rock Island Argus and Moline Dispatch on September 22, 2002.